Simple: We all know the health benefits of not smoking. Quit smoking, live longer. But Not Easy: The actual act of quitting is really hard. But Not Easy: Working out frequently, cutting down on your favorite fatty foods, and eating healthy, is the hardest thing to do when you’re overweight. Simple: Take good care of your customers, and address their questions and concerns quickly. But Not Easy: The amount of time and effort spent and processes you need to put in place. And sincerely caring about your customers. Simple: Build something that people want or need with a unique twist, go really deep in features, and address all the benefits. But Not Easy: Think Microsoft. All the money and resources and clout in the world, yet they give us Windows ME and Vista. Simple: Build a membership site, add great content, price it well and market it well. But Not Easy: Implementing the right membership software, creating great content consistently, doing the research and testing on pricing, implementing solid marketing. If you just looked at what needs to be done, a lot of things in life are actually quite simple. But the act of just doing it, doing it well, and continuing to do it well, is never ever easy. Hope you don’t settle for the easy in life. Because nothing worth doing in life is ever easy. Simple, may be, but never easy. Check out Steve Ballmer’s modest office. 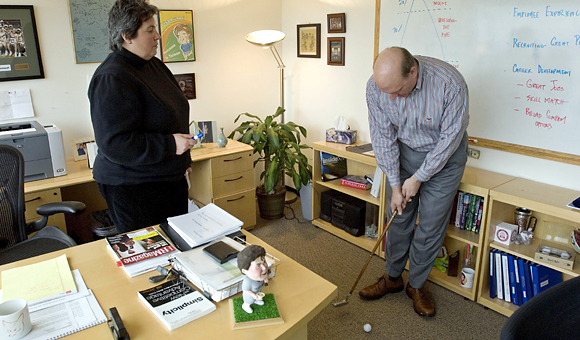 What is it with corporate executives playing golf within the office? Are you somehow cool for being unprofessional and playing a game while someone’s trying to talk business with you? I just don’t get it. Let me know if you do.